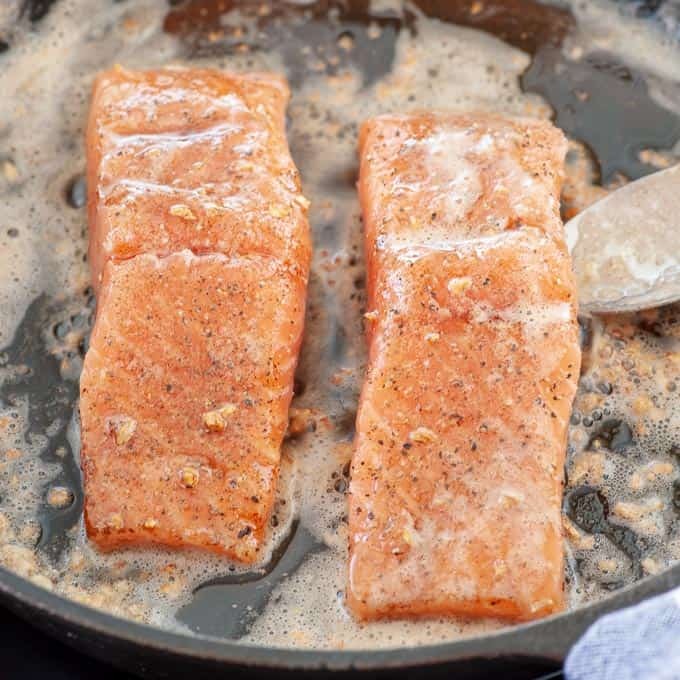 Here’s a cast iron skillet seared salmon recipe that’s sure to please. Easy to make in less than 20 minutes start to finish. The result is perfectly cooked, moist, flaky salmon. 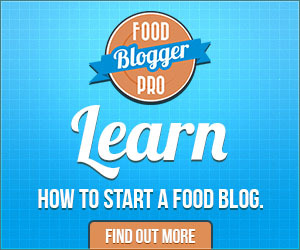 There are so many ways to cook salmon….and I’ve got quite a few posts on salmon. Like Salmon Salad Nicoise, Slow Baked Dill and Citrus Salmon, and One Pan Salmon Meal. This dish has quite a different flavor profile from these others though. You start out by browning some butter, then adding a minced garlic clove. The salmon gets finished with a little honey glaze and you end up with a great tasting piece of salmon. I chose a cast iron skillet for this salmon because it gets finished under the oven broiler. Any oven safe skillet will work, it is just that the cast iron holds the heat so well. I give the salmon a couple of minutes of resting time under a lid. Start your skillet over medium heat to melt the butter. The butter will bubble and start to give off the water it contains. Once you see the milk solids start to caramelize, (like the picture above), lower the heat so the bits don’t burn, but slowly add color to the butter. 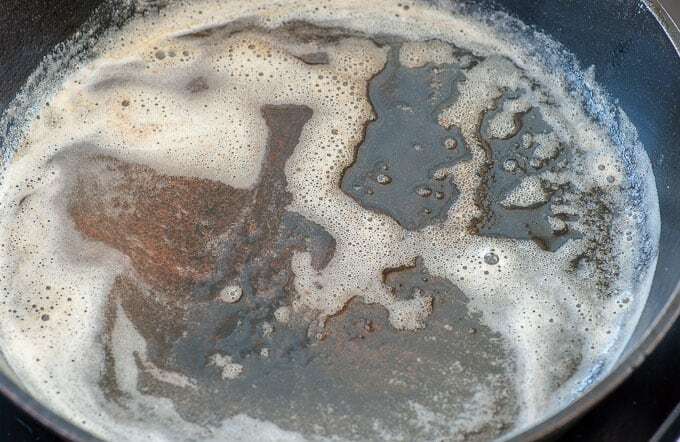 You want the butter to turn slightly brown while using a spatula to move the liquid around the skillet. Keep the stove on low to medium low and add the minced garlic. Stir it around and in 30 to 45 seconds you should start to smell the distinctive garlicky aroma. Salt and pepper the salmon filets and place them skin down into the skillet. Let them cook for 6 to 8 minutes while basting them every minute or so with the butter and garlic. I just tip the skillet a bit and use a spoon to coat the salmon. I included the picture above to show how much the salmon should be cooked through before placing under the broiler. This is after about 7 minutes cooking time. In a small bowl, place a tablespoon of honey, then add a spoonful of the hot butter to thin the honey a little. 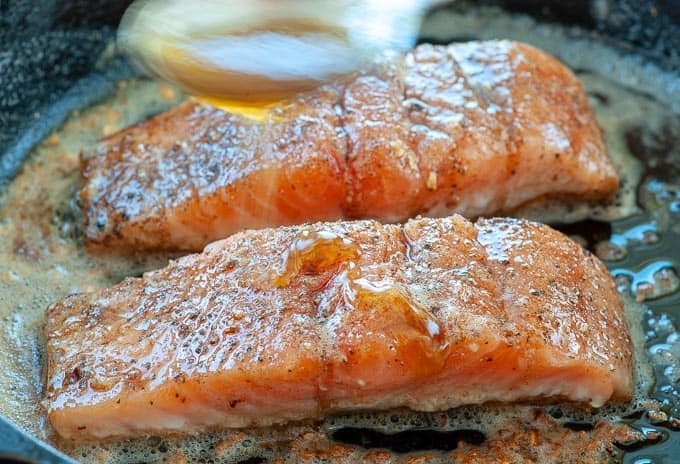 Drizzle the honey over the salmon with a spoon then place it straight under the broiler. Broil for 2 minutes keeping an eye on the salmon so the honey doesn’t start to burn. Remove from the broiler and drizzle a bit more honey on the fish, then place a lid over the skillet. The hot skillet will finish the cooking of the salmon. Two minutes should do it. You’ll end up with perfectly cooked salmon that’s moist and flavorful. Serve with some lemon if desired. If you make this seared salmon recipe, take a photo and place it on your Instagram. Hashtag #joeshealthymeals. I’d love to see what you’re cooking! 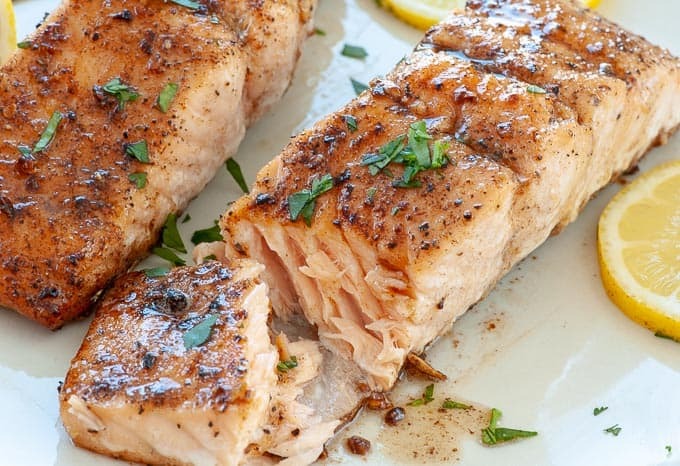 Perfectly cooked salmon fillets that are super flavorful. Place oven rack 7 or 8 inches from the broiler element and turn on broiler. Place butter into a cast iron skillet or other heavy oven safe skillet and melt over medium heat. Stir the butter around until the milk solids start to caramelize, then lower the heat to low. Keep stirring while the butter starts to get a brown color and you may notice a slightly nutty aroma, (5 or 6 minutes). Stir in the minced garlic cook until fragrant, 30 to 45 seconds. Salt and pepper the salmon, then add to the skillet, skin down. Baste the salmon with the butter using a spoon by tipping the skillet to get a nice spoonful. Do this every minute or so. Cook the salmon until it is nearly halfway cooked through, 7 minutes. Put 1 tablespoon of honey in a small bowl and add a spoonful of hot butter from the skillet. Stir to thin the honey. Drizzle about half of the honey over the top of the salmon fillets. Place the skillet under the broiler. Broil for 2 minutes keeping an eye on the salmon so that the honey does not burn. Remove from the oven and drizzle the salmon with the remaining honey. Cover the skillet with a lid for 2 minutes to finish the cooking and to rest the salmon. Serve right away with lemon if desired. This was so delicious! 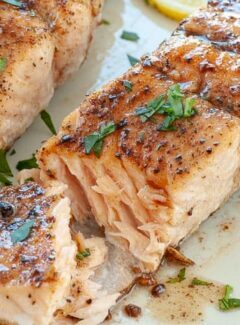 I just love salmon, the honey butter combination is wonderful and the fish was cooked perfectly.